Shou Wu Pian - This product was discontinued by our supplier Sept 2014. Please order Plum Flower Brand Shou Wu Pian or Long Hay Flat Brand Fo-ti which are replacements for this product. Shou Wu Pian. This longevity tonic nourishes Liver blood and tonifies the Kidney's. Taken regularly it is said to increase vigor, prevent premature aging, strengthen the sexual function, and lengthen life. It also strengthens the sinews and bones. 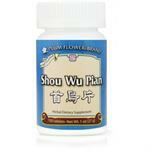 Shou Wu Pian nourishes the hair and is widely used in China to keep hair from graying. It also is said to strengthen muscle and improve stamina. Take 5 pills three times a day. 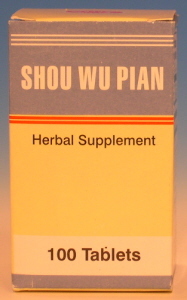 Contains: Fo-ti extract (Polygonum Multiflorum, Chinese: he shou wu). Other ingredients: sugar, talc, cornstarch, magnesium stearate, zein, and FD&C Red No. 3. Note: The efficacy of this product has not been confirmed by research. Traditional use does not establish that the product will achieve the claimed results.